In this compelling bestseller, Max Lucado takes readers through the drama of Jesus' death and resurrection - from his agonised prayer in the garden of Gethsemane to the tomb that could not contain his glory. Experience anew the power of God's saving grace! 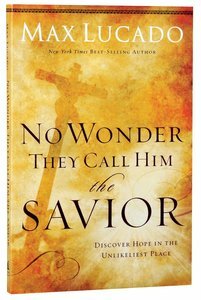 About "No Wonder They Call Him the Savior"
Its hope lures all searchers. Far more than a gold-plated symbol of religious belief, the cross is the centerpiece of the Christian faith -- the meeting place of time and eternity. Where God and man encounter each other. Max Lucado takes you through the drama of the death and resurrection of Jesus Christ -- bringing to life Peter's denial, Pilate's hesitancy, and John's loyalty. Relive the events leading up to Jesus' crucifixion, from the foggy garden of Gethsemane to the incandescent room of the resurrection. No Wonder They Call Him the Savior leads you up the hill of mankind's highest hope and reminds you why he deserves to be called our Savior.